Leading Manufacturer of dust collector filter bags from Ghaziabad. We bring forth the best quality Dust Collector Filter Bags that are used to be fitted in dust collectors. The offered Dust Collector Filter Bags are designed and manufactured using the best quality raw material and advanced machines under the guidance of our experienced professionals. 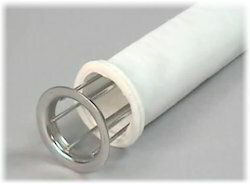 Also, offered Dust Collector Filter Bags are widely demanded for its features given below. Our clients can avail these bags from us in various designs as per their accurate needs.